Welcome to an environment of deep connection and embodied natural rhythms. If you are here, like me, you believe that true strength and wisdom arise from within. You seek healing from holistic sources and your own embodied inquiry. You seek flowing somatic movement, yoga, reiki and energy healing, meditation, music, art, and spirit. You long for quiet reflection, luscious walks in the woods, fluid breath and purposeful wise movement. Let us walk together in the journey to search for connection, meaning, and expression. Jai Studios hosts guest teachers each season! Experience our unique offerings such as: Yoga Nidra, Restorative Yoga, Somatic Movement, the Emotional Self, Music events, and more! Learn Reiki in a picturesque setting in rural Vermont, and more! Angie has been a lifelong artist. She exhibits her handmade paper and mixed media creations, as well as teaches workshops. She is a member of League of NH Craftsmen, Vermont Hand Crafters, and The New Hampshire Art Association. See her work and take a class! Myriad Yoga Teacher Training is a comprehensive Yoga Teacher Training school, with over six years of training experience and over 42 graduate certified teachers! We are now accepting applications for the 300 hour advanced training starting February 2019, and an intensive 200 hour training summer 2019! Myriad Flow is a practice of bringing forth our most Optimal Self through asana- postures, pulsing movement, breath, and mindful attention. Myriad Flow is designed as a total wellness system that recognizes the vital need to honor the individual and unique needs of each practitioner as they change over time, while simultaneously recognizing that we are all connected at the source of Spirit. Meet our experienced and caring family of teachers! We offer 200 and 300 hour training programs. Our trainings are the most comprehensive and complete trainings you can invest in. Our aim is to give you all the skills you will need to teach with confidence and ease. Myriad Yoga Teacher Training honors Yoga’s rich heritage and tradition while staying up to date with modern anatomical studies and the somatic movement exploration. Work with Angie to schedule your private yoga and mindful movement consultations, energy work including Reiki and Attunement healing, and 1:1 or group plant based cooking classes! Our beautiful studio is nestled at the base of Mt. Ascutney in the heart of Vermont and sits along the beautiful Mill Brook. It is an idyllic natural setting to support your creative mindfulness and wellness journey. Art Studio, Weekly Yoga, Trainings, Special Events, and more! 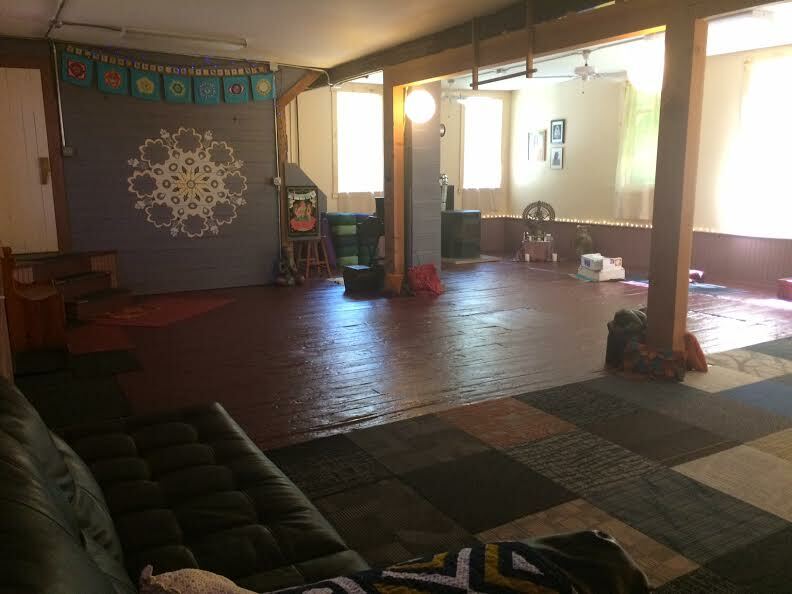 A unique creative healing space in rural Vermont. We respect your privacy. See our terms and policies for more information.